berenbaum's: No Dice Part II: Underdog or Pariah? 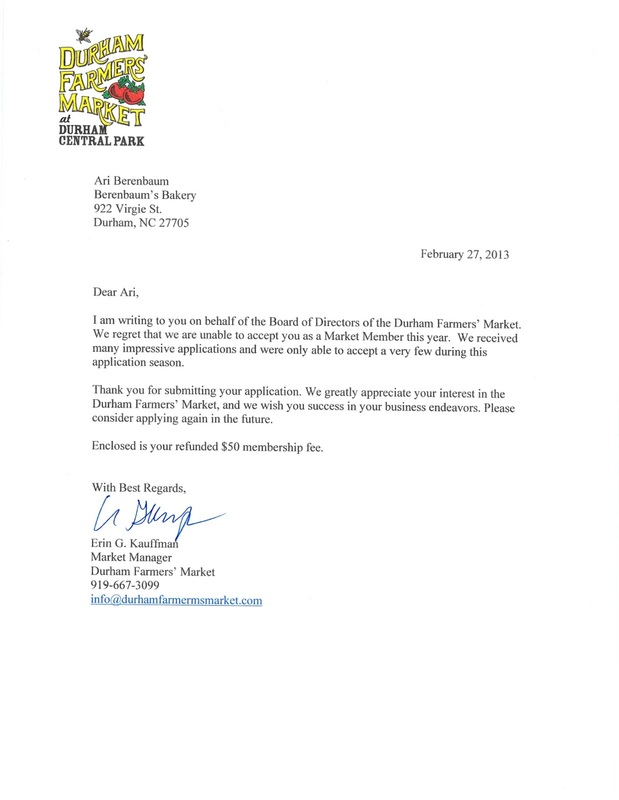 For the second year in a row, our application to the Durham Farmer's Market (downtown) has been rejected. I learned over the weekend that so many of the farmers come from Orange and Chatham counties that the market should be called the Orange-Chatham Farmer's Market. What the Board has against a local sliding-scale Durham bakery that specializes in Jewish and vegan goods (neither of which can be found at market), I do not know. I will not bother to send a request for information to the Board as they never replied to my letter last year. 6. How do you currently market and sell your products? We currently sell on Hunt Street, at the South Durham Farmer’s Market, to our café customers (Joe van Gogh, Respite Café, Bean Traders (Homestead Market), the Daily Grind (UNC), and Friends Café (UNC)), and via bike delivery to the Durham residents of Old West and Watts Hillandale. Entering the Durham Farmer’s Market would be amazing. We have been selling from our corner on Hunt Street for two years and have gained a loyal following (520 Facebook Fans). I understand that Loaf and Scratch and other vendors sell baked goods, so I would want to focus on products that you cannot currently find within the Farmer’s Market. Those products would be vegan baked goods. Our vegan hand pies are extremely popular (we make about 300 every weekend) and serve an underserved community of vegans and otherwise health-conscious people in Durham. We receive comments via Facebook every week thanking us for our service to the vegan community. We use Lindley Mills organic flour, and would make a commitment to buy Farmer’s Market vegetables to use as filling for the hand pies. Also, all of our goods are baked less than a mile away from the market (at Ninth Street Bakery Downtown). If Loaf would like, we would be happy to agree not to sell any artisan hearth-baked breads so as not to compete with their business. We collaborate every week with vegan Chef Matt Props on our vegan hand pies. Here are some delicious flavor combinations to get you excited: Cuban Black Bean Savory Vegan Hand Pies, Caramelized Banana Sweet Vegan Hand Pies, Smokey Mushroom and Greens Savory Vegan Hand Pies, Savory Vegan Shepherd's Pie Hand Pies, Pumpkin Chai Sweet Vegan Hand Pies, Sweet Apple Caramel Vegan Hand Pies, Ginger Scallion Savory Vegan Hand Pies, Jamaican Jerk Tofu Savory Vegan Hand Pies, Thai Peanut Tofu Savory Vegan Hand Pies, BBQ Tofu Savory Vegan Hand Pies.